This premium class theme is designed specifically for the e-commerce websites. With the designer with the drag-and-drop interface, which has already impressed many users with its simplicity, the site can be created a matter of minutes. The design of the theme is very elegant and modern. And itâ€™s easy to configure. The theme provides many ways for rapid development. Being built on the basis of the powerful Shopify platform, it provides support for convenient menus, SEO-friendly options for promotion, and the ability to integrate with the social networks. Your site will work with any browser and device, which is ideal for a modern web solution. Bootstrap is an open-source framework for webpage and apps design. Bootstrap is a really useful instrument and that's the cause it's extremely well-liked. Using this type of framework, it will be easier to build responsive design, fitting for any form of display screen size, prototype brand new designs without complications and be sure your own internet page is really cross-browser compatible. Retina Ready desing templates are the most effective option to show your high-resolution photos on screens with any kind of pixel-density. Along with the resolution and beauty of the picture, this display screen has the best observing angle. And at the same time - no limitations on the display speed. Responsive web page design technique makes a web page's screen variable for any kind of screen resolution. Regardless of what sort of gadget your clients might use to enter the web business - they can see a vibrant picture having a hassle-free navigation menu. It's an especially worthwhile function, taking into account that nearly all potential customers currently choose their mobile phones for web browsing. What is a buyout purchase license for Shopify theme for Sport Equipment ? If you purchase the product at a 'Buyout price' it guarantees that you are the last person to buy this template from us. It means that this Shopify theme for Sport Equipment may have been sold before a couple of times (see 'Downloads' number in item's properties) but only you and people who bought the template before you will own it. After this kind of purchase the template is being permanently removed from our sales directory and is never available to other customers again. The buyout purchase license allows you to develop the unlimited number of projects based on this template, but the template should be customized differently for every project. Is it possible to use your Shopify templates for Sports Reports to develop websites for my customers? Yes. It is perfect for designers who want to offer their customers a high-quality design and also save time and money. Keep in mind that when you purchase the Shopify theme for Karate Weapons with ordinary or exclusive license you're entitled to create only one project (one domain name). Is it possible to buy the particular image from the Sport Kit Shopify design? No. 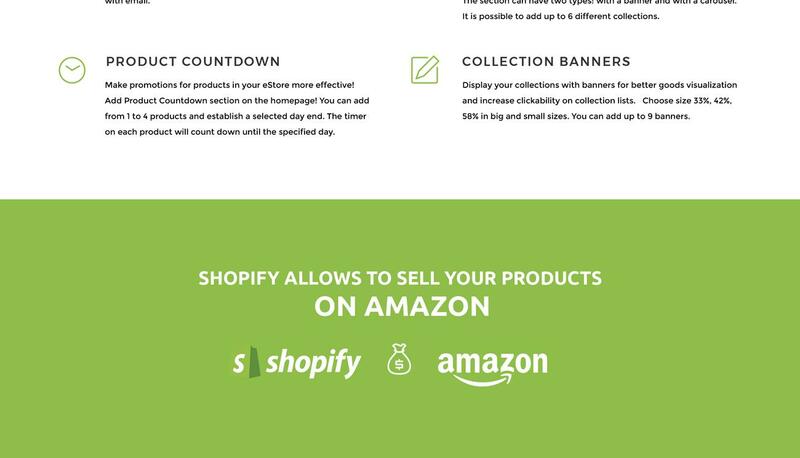 According to our Terms and Conditions we never sell the images separately from Shopify themes for Hunters (as well as the templates separately from the images). I ordered a Shopify ecommerce theme for Sport Teams but haven't received the download information. In case of not receiving the download information of a Shopify ecommerce theme for Sport Teams, please contact our Billing Department via support chat by phone or e-mail. What is Developers License for Shopify template for Live Scores Website? If you purchase a Developer's license, you are granted a non-exclusive permission to use the Shopify template for Live Scores Website on up to 5 domains for projects belonging to either you or your client. What is the difference between unique and non-unique Shopify template for Live Scores Website purchase? Non-unique purchase:Non-exclusive purchase means that other people can buy the Shopify template for Live Scores Website you have chosen some time later. Unique purchase:Exclusive purchase guarantees that you are the last person to buy this template. After an exclusive purchase occurs the template is being permanently removed from the sales directory and will never be available to other customers again. Only you and people who bought the template before you will own it. Is there any return policy for Hunting Shopify templates? Requests for a refund are accepted at www.template-help.com/tickets within the period of 2 weeks after the order of Sport Kit Shopify design is placed. You should accompany this request with detailed and grounded reasons why you apply for a refund. Please make sure your request does not contradict the terms and conditions specified in the policy. A refund is issued to you upon receipt of a Waiver of Copyright signed by you. Will the Shopify theme for Hunting be deleted from TemplateMonster database? No, the Shopify theme for Hunting will not be deleted from TemplateMonster database. Is it possible to reactivate my download link for Shopify ecommerce theme for Hunting Equipment if it was deactivated after 3 days? Yes. Please re-activate the download link for Shopify ecommerce theme for Hunting Equipment within your account under the Downloads tab or contact our billing department directly regarding that. How can I modify Shopify design for Extreme Sports to suit my particular website? Please visit our Online Help Center to obtain detailed instructions on editing Shopify design for Extreme Sports . Are there any restrictions for using imagery, cliparts and fonts from the Shopify ecommerce theme for Outdoors Sports I purchased? All imagery, clipart and fonts used in Shopify ecommerce theme for Outdoors Sports are royalty-free, if not stated otherwise on the product page, and are the integral part of our products. One Time Usage License and Developers License give you the right to use images, clipart and fonts only as a part of the website you build using your template. You can use imagery, clipart and fonts to develop one project only. Any kind of separate usage or distribution is strictly prohibited. Can I customize the Shopify ecommerce template for Kung Fu Weapons? Yes, you can customize the Shopify ecommerce template for Kung Fu Weapons to any extent needed. You cannot use a header of the template for one project though, and images from the template for the other project. Can I get the extended license for some other pricing than the half of the initial Shopify design for Self Defense Weapons price? No. The price for purchasing license for a single Shopify design for Self Defense Weapons is the half of the template unique price. 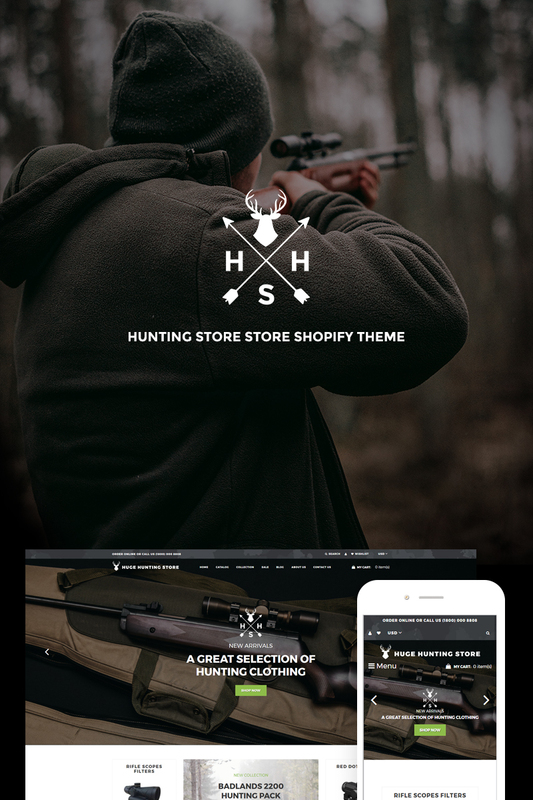 Can I contact the Hunting Shop Shopify template author? Yes. You can contact this Hunting Shop Shopify template author/author's team directly using your personal account under the Support tab. I would like to purchase Weapons Shopify template, but it is not available on the site anymore. The Weapons Shopify template has been sold out for exclusive price or discontinued.As technology inevitably develops, TemplateMonster may discontinue the production of certain products. It can be no longer available for sale because of being outdated. Can I resell the Shopify theme for Sport Magazine as is? No, you cannot resell the Shopify theme for Sport Magazine as is. Can I resell Shopify designs for Weapons Store I bought the developers license for? You cannot resell the customized Shopify ecommerce theme for Hunting Equipment as a template, but you may sell it as a project to your client. What is a one time usage license for a Sports Shopify theme? When you buy the Sports Shopify theme at usual price you automatically get the one time usage license. It enables you to use each individual product on a single website only, belonging to either you or your client. You have to purchase the same template again if you plan to use the same design in connection with another or other projects. When passing files to your client please delete the template files from your computer. Can I put a line at the bottom (or any other spot) of my new product "Website development by Company name" after purchasing Hunters Website Shopify theme? Yes, you can place a note at the bottom (or any other spot) of my product "Website development by Company name". Nevertheless, you cannot place "Website design by Company name" while using one of Hunters Website Shopify theme. I like the image from the Outdoorssports Shopify template and would like to use it for my advertising campaign, can you send me this image in a higher resolution? No, we can't provide image in higher size or resolution rather than it is on the Outdoorssports Shopify template. We recommend looking for professional images on online photo resources. What do I receive when I order a Shopify design theme for Weapon Shop from TemplateMonster.com? After you complete the payment via our secure form you will receive the instructions for downloading the Shopify design theme for Weapon Shop. The source files in the download package can vary based on the type of the product you have purchased.If you need unzipping software to open the .zip archive, Windows users may visit www.WinZip.com, Mac users may visit www.StuffIt.com. Do you provide any scripts with your Outdoors& Travel Shopify themes or could you do some custom programming? Our templates do not include any additional scripts. Newsletter subscriptions, search fields, forums, image galleries (in HTML versions of Flash products) are inactive. Basic scripts can be easily added to a Hunters Equipment Shopify design theme at www.TemplateTuning.com If you are not sure that the element you're interested in is active please contact our Support Chat for clarification.